Accidentally Do This and Your Client Will Go Bonkers! 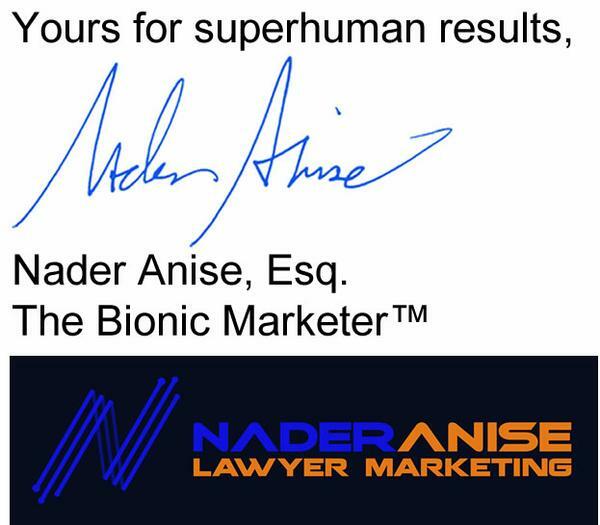 A few months ago, I was talking with my friend Alan about an experience he had with a trademark lawyer. In fact, he was so fuming mad after it happened, he fired the lawyer on the spot. There was no second chance. Once the trust had been breached, Alan was done. At $350 an hour, an extra 15 minutes comes to $87.50. That’s not a small amount of money. Alan confided in me that from the get-go, getting billed on an hourly basis really stressed him out. He’s a small business owner and so money is tight, especially when it comes to paying lawyers. So, the obvious question is: Did the attorney, in fact, keep Alan on the phone for an extra 15 minutesjust to pad his bill? I guess we’ll never know for sure. If the answer is yes, then the attorney got what he deserved. He should know better than to try to prolong the phone conversation purely for financial gain. In other words, if you’re on the phone (or sending an email), keep in mind that clients have basically one thing on their minds: THE METER IS RUNNING… HOW MUCH IS THIS GOING TO COST ME? It’s true. Believe me. So, you never want to take for granted that the client is ok with you babbling on and on. The fact that Alan “felt” the lawyer was trying to milk the phone call was enough, even if Alan’s feelings were incorrect or unjustified. 1. If you’re asked a question on the phone or in an email, and that question can be answered with a simple yes or no, give the simple yes or no answer. Being considerate of the client’s time and money in that way will pay off in the long run in the form of additional business and referrals. 2. If you need to speak to the client for a prolonged period of time, tell them it might take x minutes and ask them if they are ok with that. If you demonstrate to the client that you are being careful in keeping their bill as low as possible, you will be a ROCK STAR in their eyes. 3. When at all possible, charge clients a flat fee instead of bill them by the hour. Granted, a flat fee may not always be ideal (or practical) for you as an attorney, but clients love it because there are no surprises (plus they don’t have to pull out a stopwatch every time you call them with an update). That’s it for now. Just remember, the more considerate you are of the client’s time and money, the more you’ll be rewarded now and in the future. P.S. I have big announcement coming up. I’ll share it with my “Bionic Bytes” text alert subscribers first. If you haven’t signed up, I suggest you do that now. Just pull out your cell phone and text:BIONIC to 313131 and you’ll be instantly added to the list. It’s a FREE service.